Rocketober 31: Halloween Theme - Spooknik! This month, I've been posting photos on Twitter for #Rocketober. They'll appear here with slightly expanded text. October has gone fast! While I haven't kept up with the Apogee Components #Rocketober theme of the day on Twitter, I have been building. For those following the Sky Wolf rocket build, that will continue until the rocket is finished, despite the fact that I haven't completed it within the month. But it's nearly done, and I've had a couple projects on the table, so I feel I've been productive. I'm planning more material for beginners, which is what The Rocket N00b is meant to be about, and once these other three or four rockets are completed, I'll have some more good stuff for you. 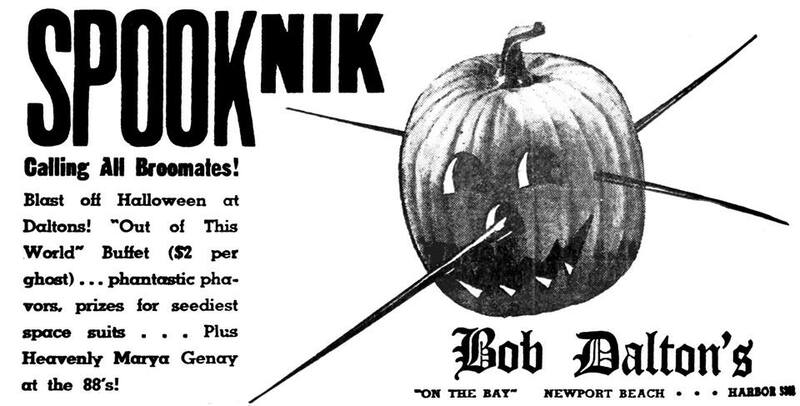 For now, however, the night grows short - the witching hour is near at hand, and Halloween is almost gone! So, let's get back to Sky Wolf. To catch you up, Sky Wolf is a 38mm diameter mid power rocket, sold by JonRocket.com, and created by Sky Pyrates. It's one of a couple designs created for the 2015 National Sport Launch as a limited edition commemorative rocket. The 38mm tube is about the same outer diameter as a BT-60, so the rocket is roughly the same size as something like the Estes Big Bertha, but sturdier and much more powerful - it can fly on anything from a D to an H motor! I made a lot of work for myself attempting to sand the fins into streamlined, airfoil shapes. Plywood is much harder than balsa, and after an hour working on one fin, I set everything aside for a few days. When I returned to building a few days later, I realized the problem: I had been using 220 grit sandpaper. 220 grit is a medium fine grit, which is fine for shaping balsa fins, but far too fine for shaping tougher plywood. I switched to 150 grit and got back to it. Sanding fins to shape can be tedious work, so it's helpful to have a CD player in the workshop. I also realized that the Sky Wolf fins aren't supposed to be airfoiled. Airfoiling isn't necessary on any model rocket. Some say good airfoils will help you achieve a higher altitude (some say it won't really, but we'll get to that in another post). I do it because I like the finished look of a nice airfoil shape. But Sky Wolf was designed to whistle in flight - to get the best results, you're meant to merely bevel the leading edge of the forward fin, and leave all other edges square. The way I've shaped these fins, the rocket may not whistle. But it will look great, and I was committed once I did the first fin. So forward I went. Continuing to stack fins together to compare them, then sanding the uneven spots, eventually you get to the point where you've sanded enough, and it's time to stop. Now, if you look at the above photos, you can see that the airfoils are a little uneven. Sanding decent airfoils in model rocket fins is surprisingly not terribly difficult. It takes a little practice, and it is a challenge, but it's not hard. Still, it does take patience. If you rush, you'll get sloppy airfoils. After an hour and a half or so working on these, you can see I got a little tired, and they came out uneven. While I do sand airfoils in the hope that it might help increase the altitude of the rocket, this probably won't be the case here. 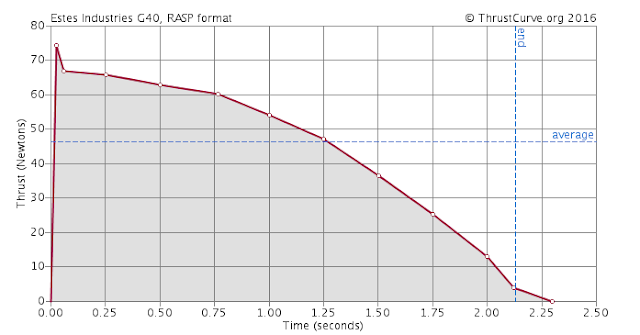 An uneven airfoil can cause the rocket to roll, or spin about its vertical axis. Uneven airfoil over the fins can cause constant lift, an aerodynamic force, on one side of the fins, which may cause the rocket to spin rapidly in flight. That spinning takes energy, and the process increases aerodynamic drag on the rocket. 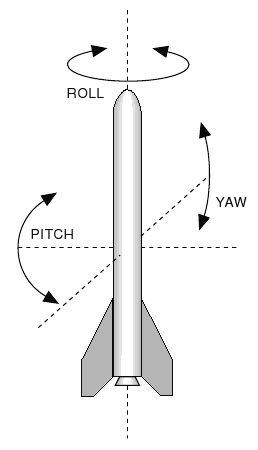 Lift is a corrective force which pushes on the fins when a rocket starts to deviate from its intended path in flight, but constant lift on one side of all the fins can cause the rocket to spin. Lift is a stabilizing force, but it also causes drag. Lift on one side of the fins can cause roll - spin around the vertical axis. But most model rockets roll to some extent, regardless of whether the fins are streamlined, or how good the streamlining is. Building a rocket that doesn't roll at all is pretty hard. Since, at this point, I've decided I'm going for looks over performance, I don't mind. You can see how uneven the fins are in the above photo, where they're sandwiched together, but once they're on the rocket, you'll have to look pretty critically at the fins to see the flaw. The rocket will look great - and regardless of roll, will still fly very high. Next I moved in to the aft fins. I started the beveled edge with a wide angle - about 35 to 45 degrees per side. Again, I'd drawn a guide line down the middle of the fins' edges to help keep my sanding centered. Again, I went a little too far on some of the sanding, and they came out pretty good, but not perfect. Still, looking at each fin individually, they look good enough, cosmetically speaking. Finally, it was time for one of my favorite parts, when the rocket actually looks like a rocket - attaching the fins. Getting the fins to go straight up the body tube was no problem, since I had cut the fin slots. But to keep the fins perpendicular to the body tube, I used the Guillotine Fin Jig. Attaching the first fin set. As per instructions, I used slow cure epoxy. The fin jig not only keeps the fins perpendicular to the airframe, but in line with each other. Finally it was time for fin fillets. For these, I again used 30 minute epoxy, mixed with a filler called microballoons. These are microscopic spheres of silica glass. They make the epoxy less dense, so the fillets will add less weight. They make the epoxy more viscous and less prone to sagging, so the fillets will hold their shape as they cure. And they make epoxy easier to sand, if necessary. I did only one fillet to begin with. The microballoons give the epoxy its milky white appearance. I went with a fairly small fillet radius, using a thin dowel rod dipped in rubbing alcohol to shape it. I also need the epoxy to fill in any gaps in the fin slot. Once the epoxy is cured, I'll need to check with a fingernail to be sure the gap is filled. If it isn't, I'll go over the fillet with one of a slightly larger radius. It can be hard to see if the slot is really filled just by eye. But if it isn't, it will certainly show up when I put on primer. I'll need to check it by feel before I get to that point. Last night, on the Facebook group Space Hipsters, someone posted something I found truly fantastic: newly digitized vintage film from an Estes Cineroc launch, taken by her father. I sent her a message and asked if I might share it here. 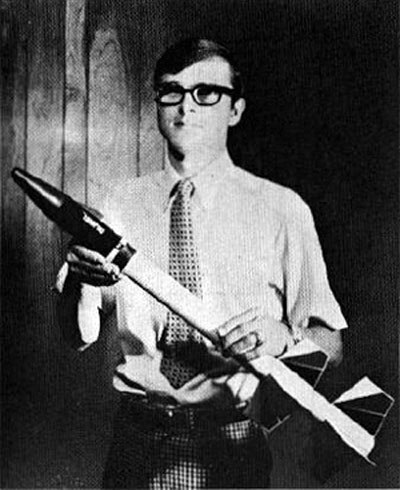 The Cineroc was a two-stage model rocket produced by Estes from 1970-1975, and was the first commercially-available model rocket to carry a motion picture camera payload. Its predecessor, the Estes Camroc, which debuted in 1966, would take a single still photograph at apogee. The Cineroc carried a small, rear-facing 8mm film camera inside the nose cone. For the first time, model rocketeers could get a view of what it might be like to ride along with their rockets. The Cineroc was much-coveted but short-lived. The company that made the mechanism for the camera stopped making it, so the story goes. Today, a good-condition Cineroc can go for hundreds of dollars, and is very sought-after by collectors. The rocketeer in this case was Scott Pace. The launch was filmed in the Lucerne Dry Lake in the Mojave Desert, which is still used as a launch site by high power rocketeers to this day. The film was shot in 1975. Pace was about 16 at the time. You can find a number of Cineroc videos on YouTube, but they're rare. Much of the 8mm film footage from the day probably ended up in garages across the country, and were either lost to decay or disposal. So a good-quality video like this is a fantastic document of model rocketry history. The Cineroc was designed by the late, great Estes designer Mike Dorffler. During his 40-year career, Dorffler designed some 250 kits. The Cineroc was one of the greats. Technically, Cineroc refers to the nose cone/payload. The booster itself was called Omega, and could be purchased with an ordinary nose cone without the Cineroc. A reproduction of the Omega rocket is available from Semroc, albeit without a camera payload. But I imagine it wouldn't be too difficult to recreate a new generation Cineroc by taking the guts from an inexpensive 808 keychain camera and installing them into the nose cone. The Cineroc had a fairing on the side for the camera lens (see the image at the top of the post from TRF user K'Tesh, and check out the link for more of his great sim work). I don't know if the Semroc Omega has that fairing, but a skilled modeler could probably make one. And with 3-D printing, creating a modern, correctly-shaped Cineroc nose cone to house a small digital camera is certainly possible. And with Estes bringing back a number of classic kits these days, I could see them re-releasing the Cineroc with an inexpensive digital camera. It would probably be easier to operate and more reliable than the original. I think they'd sell a ton of them. I would certainly buy a few. One can only hope. One last interesting thing of note: The 16-year-old rocketeer - Scott Pace - who took the footage above with his Cineroc... Well, he's now the Director of the Space Policy Institute and Professor of the Practice of International Affairs at George Washington University. It just goes to show what the love of model rocketry can lead to in a kid's life. Many thanks to Carolyn Pace for sharing this with us. 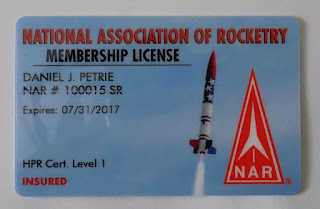 I fought off a cold last week, and then on Saturday I had a big launch to attend, so I took some time off from building and #Rocketober posting. But I've finished a couple videos in the mean time, so I'm sharing them here. The Estes Pro Series II Nike Smoke, seen above, is a great rocket. It took me far too long to build - nearly a year - because I had too many projects on the table at once. But it came out looking great, and I've now flown it twice. The first flight was on September 17, in Berwick, Maine, the same day I successfully did my high power rocketry level 1 certification flight. 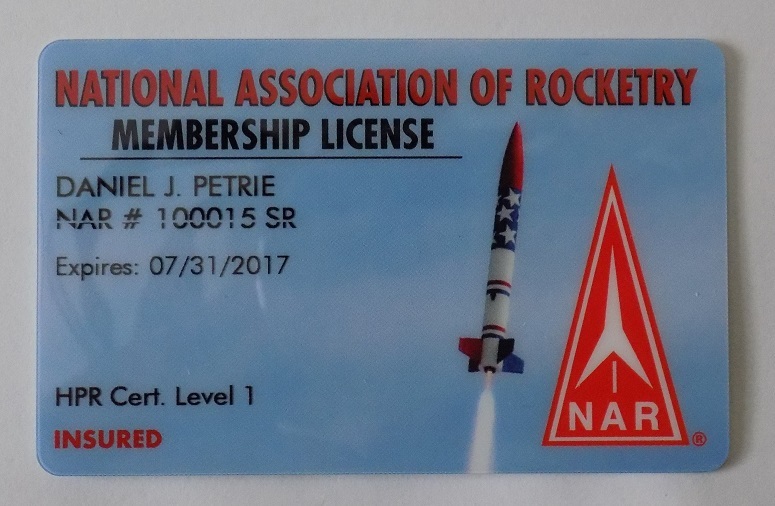 My new NAR card with the certification on it came last week in the mail, by the way. The Pro Series II Nike Smoke (you have to make that distinction, because Estes now has a smaller, low power, BT-60 Nike Smoke) has a 29mm motor tube, which means you can fly a wide variety of larger motors in it. For these flights, I selected an Estes G40-7 composite motor. These motors were manufactured for Estes by AeroTech, who makes mid and high power rocket motors, both reloadable ones and single-use. The G40 is a single use motor. It's a really fun one, with plenty of thrust, but a decent burn time of just under 2.5 seconds. Compare this with the G80, another popular motor. 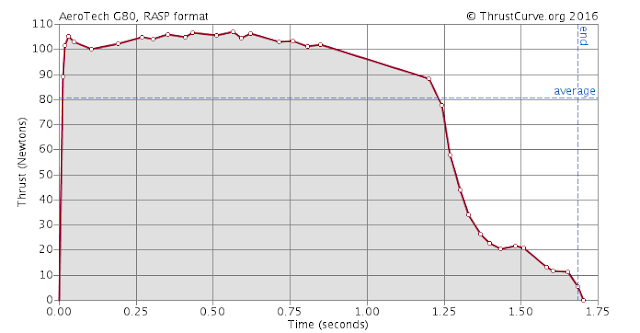 The G80 is much higher thrust than a G40, is much louder, and burns out much faster. Both AeroTech and Cesaroni make G80 motors. The AeroTech motor burns out at about 1.5 seconds, and the Cesaroni at about 1.2. G80's are fast, fun, and loud. But for the money, I like a little extra burn time, so I was glad to get my hands on a few G40's. The weather in Berwick was nice and sunny, but a rather windy. 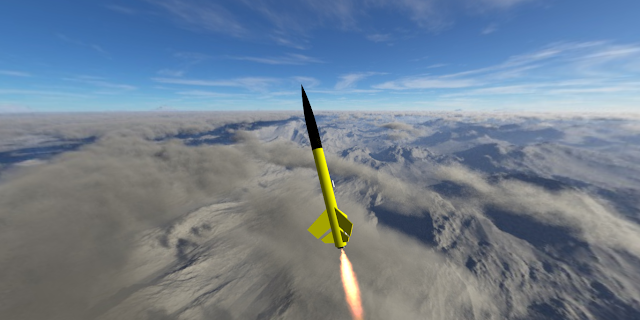 To keep my rockets on the field, I used a Jolly Logic Chute Release, set to open at 400 feet above ground. The second flight was this past weekend, on October 15, in Amesbury, Massachusetts. The Amesbury field is smaller than the Maine field, and even though the winds were lighter, we had to be more cautious. With winds blowing out of the east, all rocket flights had to be kept to a lower altitude, to avoid rockets getting caught on the large power lines to the west of the field. Again, I flew the Nike Smoke on an Estes G40-7 motor, and again, I used the Jolly Logic Chute Release, this time set to open at 300 feet. On the advice of the Range Safety Officer (or RSO - the person who's responsible for safe operations on the field), I angled the launch rail ever so slightly upwind. Unfortunately, this time, I had my handheld camera on a lower resolution setting all day, so my video footage came out a little grainy. But on this flight of the Nike Smoke, I taped a small camera to the side of the rocket. A cheap and easy way to get fun POV flight footage is to use a small keychain spy camera, called an 808 camera. These are (usually) very cheap little cameras which look like a car key fob. Some are of higher quality than others. Since they sometimes just stop working, I bought several of them for about $6 a piece. Attaching the camera to the rocket is easy. Simply wrap some electrical tape around the rocket and over the camera. You can probably hear the loud howling sound over the music. You hear that in a lot of 808 camera rocket videos, and it's from the electrical tape. The wind rushes over the tape and causes it to vibrate, acting like a large reed. What I find funny about this footage is that, at first, it sounds like someone excitedly yelling "Whoo!" but as the rocket accelerates, it changes into a sound resembling a scream of unmitigated terror. But I got a nice view of the fall colors on the ground. I'll be back up in Maine this weekend. I hope to have some more video soon. All this month I'm posting photos on Twitter for #Rocketober. They'll appear here with slightly expanded text. Still under the weather, I've only taken a few more steps on construction of Sky Wolf. The rocket comes with two inch-long launch lugs for a 1/4 inch launch rail. Simply gluing on the lugs would be the simplest option, but I also consider using launch rail buttons. Why? Well, a couple of reasons. The first is that a launch rail is a nice and sturdy launch platform. Last fall, I had some trouble with a few heavier rockets which was partly due to some wobbly launch rods. That probably wouldn't be an issue for this rocket, as those were clusters. But the rod-based launch pads my club uses can be a little tricky sometimes. The bases of them are metal fence posts hammered into the ground, and the heads are on a swivel. Sometimes I have trouble getting the launch rod to point where I want it to. Either I can't make it cooperate and angle it into or away from the wind direction as I'd like, or I try to get the rod perfectly vertical and I can't do that. The NAR recently recommended angling all launch rods and rails away from spectators rather than launching vertically. However, this is a guideline, rather than a rule. Sometimes, depending on the direction of the wind or the proximity of the spectators, launching vertically may be preferable. You have to use good judgment for safety - as well as to minimize risk of losing the rocket (so long as you observe safety first). I have had a few rockets go nearly horizontal because they weren't launched vertically (mostly two-stagers) and leave the field. So I want the option. Our rail pads are easier to control. Most high power rockets use the 1010 rail button for a 1-inch wide launch rail. While people do put 1010 buttons on smaller-diameter rockets such as this one, they're a bit big for my liking on a rocket this size. Another option is the "mini button" from rail-buttons.com. This is a launch button for the smaller metric rail, sometimes called a 2020 rail. Still very sturdy, but with a much smaller button. My Ventris uses these buttons. On a rocket the size of Sky Wolf, the mini button is less obtrusive. It doesn't even stick out as far as the launch lugs supplied with the kit. A third button option is the "micro button," also from rail-buttons.com. It's for use with a MakerBeam launch rail, and is really small. Micro buttons do stick out further than they need to for the MakerBeam rail, but can be trimmed with a hobby knife. Sky Wolf is pretty small, and not very heavy, so the micro button might work just fine. But if I fly the rocket with an H motor, I'm just not sure. So I decide this time to go with the mini button. I drill two pilot holes into the airframe, directly into the forward and aft centering rings, offering more support for the rail button screw. A drop of thin CA - cyanoacrylate (superglue) - into the holes will stiffen the paper fibers. I've been battling a cold the past few days, so I haven't done much building or Rocketober tweeting. I had some time today, though, so here's what I've done so far. The Apogee Components theme of the day is "Rocket Wish List." I have a lot of things on my wish list, but the biggest one is for Quest motors and Q2G2 igniters to come back. Once the electrical tape was removed, the shock chord was securely epoxied to the motor tube. A bit of sanding was required, as some epoxy oozed down the sides of the motor tube under the tape edges, and you need a clear space to attach the fins to the motor tube. The knot in the shock chord stuck up a little bit above the forward centering ring and hardened. While I could still get the motor mount into the airframe, the pressure would cause the airframe to distort. I sanded the knot down level with the centering rings. Since the knot isn't tied to anything, and is only used as a shock chord stop, this will be fine. The fins came wrapped in masking tape, which left sticky residue on the fins. This would need to be removed. I decided to try my standby for removing sticky adhesive goo, Ronsonol lighter fluid. Goo Gone would work, but it would soak into the fins and leave a greasy residue, possibly ruining them. The lighter fluid would evaporate, making it a better choice. Just a small bit of lighter fluid on a swab takes care of the tape residue. The fins are now all clean, and can be sanded. First, I need to check the accuracy of the shape of the fins from my simulation. I printed out the fin templates on paper and laid the actual fins on them. The aft fin is just about perfect. The forward fin is pretty close - close enough for a simulation. 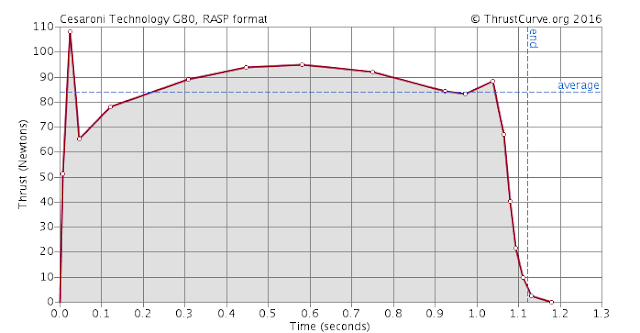 The difference in center of pressure between my simulation and a "correct" one will probably be less than a millimeter. This tool is called a sewing gauge. It's used for marking hems and button hole locations on clothing. 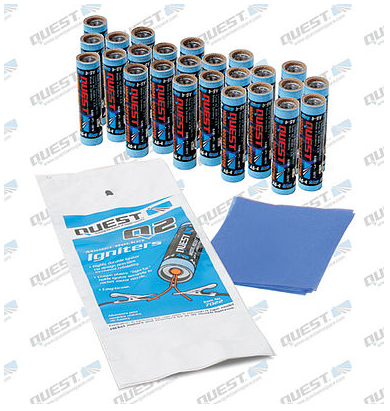 I use it to mark guide line positions on fins when I sand airfoils or beveled edges. It costs around a dollar and can be found at fabric stores or craft stores, or anywhere that sells any kind of sewing supplies. The leading edges of the forward fins will have a short bevel and rounded edge. I set the sewing gauge for 1/4 inch and make two or three marks about 1/4 inch back from each leading edge. I do all leading edges first, then adjust the gauge, and do all trailing edges. The trailing edges of the fins will have a longer bevel - about 3/4 inch - down to a much sharper edge. Once all the marks have been made, connect them with a ruler. Now I have clear guide lines for sanding my beveled edges. I'll sand to the pencil lines, then stop. I use my ruler to mark a center line down the edges of the fins. I make a mark, then flip the fin over and make another mark. Now I have a double line which gives me an indication of how close to the true center of the fin edge I'm sanding. I've rounded the leading edge of one fin. By sandwiching the fins together, I can check the sides and make sure I'm sanding evenly. Then I'll do some touch-ups if necessary. See my pencil lines? Once all three fins have been rounded over, I sandwich them together again and compare them. You should continually check your work as you sand so you can make things more even if necessary. Look at the fins edge-on as well, to make sure things are staying straight. When beveling trailing edges, again, stack the fins together to compare them. Make sure you're sanding evenly. This one will need a little touch-up, as it's slightly uneven. And when I'm done with all three trailing edges, I'll gently go over all fins to take off the sharp transition between the flat part and beveled part. When I install the motor mount, the shock chord must not be in line with any of the fin slots, because the fins will be attached to the motor tube. The shock chord must go between fin slots, and to keep things neat, I'll like it up with the launch lug line, as shown. To make sure I don't get confused when gluing in the motor mount, I've made a pencil mark in line with where the shock chord is mounted. I'll line that up with the launch lug line, and everything should fit together just fine.